Mr. and Mrs. Scatter headed for BodyVox, the Portland touring dance and performance company, the other night for the public debut of BodyVox-2, the next generation. BodyVox is a veteran company, filled with performers who have long and deep experience in ballet companies and with such performance troupes as Pilobolus and Momix. They carry their performances with the sureness and muscle memory of artists who have been living with this material for a long time, and, in many cases, who have had pieces created specifically for them and their bodies. So it’s something of a revelation to see some of these works performed by other bodies. Thursday’s performance included 10 short dances, plus a couple of Mitchell Rose’s terrific short comic films — a smorgasbord of BodyVox hits. Seeing fresh bodies perform them wasn’t just about getting to know a new crop of good dancers in town. It was also about rethinking these works as pieces of choreography that both define the BodyVox style and stand on their own as discrete works of art that have entered the contemporary-dance repertoire. These are good dancers, all of whom come to the company with significant training and who now get the opportunity to learn the BodyVox style and absorb some of the knowledge of Jamey Hampton, Ashley Roland, Daniel Kirk, Eric Skinner and other main-company stalwarts. BodyVox vet Zachary Carroll directs the second company, which already has done a little regional touring and several school shows, and he’s done a good job: If things aren’t always quite as crisp as with the main company, this is a highly promising, athletic, nimble young professional ensemble. The troupe of Jeff George, Kara Girod, Melissa Kanavel, Jonathan Krebs and Josh Murry works well together, especially on such ensemble-oriented pieces as Usual Suspects (top photo), the rollicking Hopper’s Dinner, and the nose-wiggling frolic that is The Bunny (inset photo). Despite their loose-as-a-goose moods, these aren’t easy pieces to perform, and BodyVox-2 pulls them off with a nice combination of recklessness and polish. The growth of BodyVox-2 means a couple of things. First, BodyVox has become an institution, known for a specific style that can be replicated and performed by multiple casts. That’s a big step in the arts-touring game. Second, it’s a bet on the future, a way to prepare for passing things along. BodyVox isn’t just a group of performers who work together any more. It’s a body of work. And BodyVox-2 makes it much more likely that, come that inevitable day when artistic leaders Hampton and Roland and other veterans retire as performers, BodyVox will continue to grow and thrive. You could call this a legacy moment. 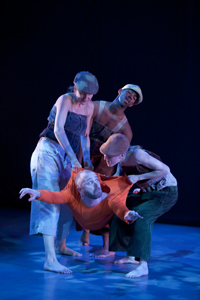 BodyVox-2 has two final performances, at 2 and 7:30 p.m. today, at BodyVox Dance Center, 1201 N.W. 17th Ave., Portland.